For three generations, the Peveto name has been instrumental in the exploration and success of the Texas oil field and beyond. From the beginning in the 1920’s with R.L. Peveto, the values and traditions of a successful family landman legacy were set forth and passed down to his son, R.S. “Jack” Peveto, and now to his grandson, Robert S. Peveto, Jr. So that even today, the original vision of a company founded on trust, loyalty, relationships, and hard work still stands as the foundation of Peveto & Associates, Inc.
R.L. 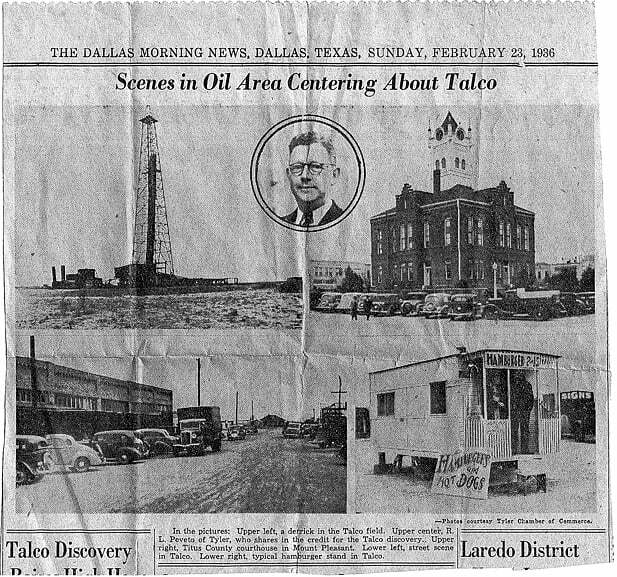 Peveto used his wildcatting skills to lease many various plots of land in what later became the Talco oil field. Life was tough for most Americans in the early 1900’s, and it took a man with grit and know-how to make a decent wage to support his family. R.L. Peveto grew up in rural South Texas. He spent much of his youth scouting the area while fishing and hunting to help feed his family, and he came to know the land well. As the Texas oil boom hit in the early 1920’s, R.L. Peveto’s knowledge of the land was key when he took a job scouting and acquiring leasing rights for oil exploration for the Roxana/Shell Corporation. As a land scout or landman, Peveto became highly knowledgeable about oil production and investment. Leaving his job as a company landman and establishing himself as an independent contractor, R.L. Peveto used his wildcatting skills to lease many various plots of land in what later became the Talco oil field in northwest Titus and northeast Franklin counties in Texas. He brought in partners for capital which included V.E. Housh and E.G. Thompson. In February 1936, the wild cat well, Housh-Thompson-Peveto No. 1 Carr, hit north of Mt. Pleasant, Texas, triggering an oil boom and energy-driven industrial era in that region and establishing the first Paluxy production along this fault zone. The No.1 Carr proved the Paluxy formation to be a major oil producing section in northeast Texas, and even today, Peveto & Associates Inc. holds 250 acres of oil producing land in this area. In 1982, R.L. Peveto was the petitioner in the historical and landmark Supreme Court of Texas case, Peveto v Starkey, which upon his successful judgment, changed how oil and gas contracts are written as they pertain to the Rule Against Perpetuities and Top Royalty Deeds. Peveto v Starkey was a landmark decision that continues to be studied by universities of law today. R.L. Peveto resided in Tyler, Texas, from 1929 until his death in 1980. He was a leader in the East Texas oil industry and a founding member and the first director of the International Oil Scouts Association. Active in his community, R.L. Peveto was a Mason, Shriner, and a member of many civic groups as well as Christ Episcopal Church. In 1976, R.L. Peveto passed his established business to his son, R.S. “Jack” Peveto, who was an experienced and successful landman himself through his work for Humble Oil Company. After many successful years and in his later years, R.S. “Jack” Peveto again passed the business to his son, Robert S. Peveto, Jr., who continues to lead the historical family business into the 21st century with the same values and traditions established by his father and grandfather. In 1980, Robert S Peveto, Jr. officially became full time in the oil and gas industry working as an independent landman for many of the smaller oil and gas companies that were involved in the East Texas basin drilling for oil and gas. For the most part, these operators where looking and finding three and four well formations in the East Texas Basin. In 1984, Robert went to work as an independent landman for Fina Oil and Chemical Company, (Total Petrochemicals USA) working East Texas, North Louisiana and South Arkansas for many years until Fina closed the Tyler office and moved the office to Houston in 1990. In the same week Sonat Exploration Company, predecessor of Southern Natural Gas of Houston, and later Sonat Exploration Company with a Tyler, Texas office needed a crew working down in Nacogdoches, San Augustine, Sabine, Trinity, Polk, Jasper and Newton, County. These were areas of deep East Texas early horizontal drilling activity until Sonat merged into another company and moved to Houston, Texas. After leaving Sonat as an independent landman in 1997, Robert S. Peveto, Jr. begin working as a partner with a brokerage firm with about 30 people involved with running title, buying leases, curative and ROW work within the East Texas Basin for many oil and gas companies. In 2006, R. S. Peveto, Jr. Properties Inc. was formed and was changed to Peveto & Associates, Inc. in 2009. The company operates as a brokerage firm for clients like EOG Resources, Inc. in many areas of Texas and can provide services most anywhere within the United States. Robert S. Peveto, Jr. resides in Tyler, Texas with his wife of 44 years, Debbie Peveto and has two sons, Clint Peveto, graduating from Texas Tech University with a PLM Degree, with two children, and Grant Peveto, RPL, graduating from Texas Tech University with an Engineering Degree, married with three children. 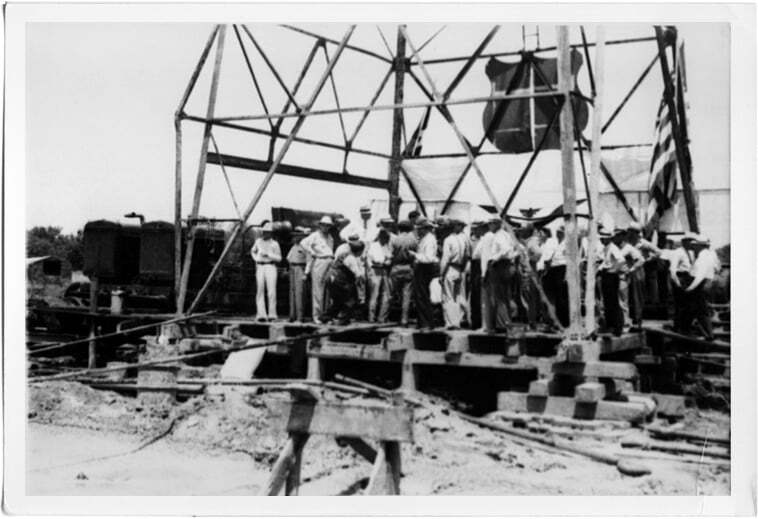 The discovery well in Wieland Field in 1944 Hunt County, Texas with partners Payne, Nenney, Johnson and Peveto. This well became the 100,000 producing oil well in Texas. Copyright Peveto & Associates, Inc., 2019.